Lillian Hellman was a playwright, screenwriter, memoirist whose most famous piece of writing may well be the letter she wrote in 1952 to the House Un-American Activities Committee stating “I cannot and will not cut my conscience to fit this year’s fashions..” In effect she refused to name names to Congress like many of her leftist contemporaries and as a result was blacklisted for a number of years. 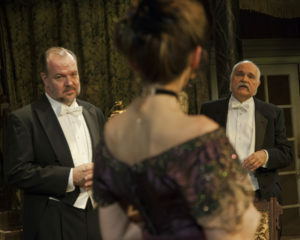 But then again her most famous work might be the 1939 play The Little Foxes. Tallulah Bankhead headed the cast of the original Broadway production while Bette Davis took her role in the film version. The characters in this especially bitter but also witty play have attracted the likes of Anne Bancroft, Margaret Leighton, George C. Scott, Lee Grant, Barbara Barrie, Carroll O’Connor, Bruce Davison, Elizabeth Taylor, Maureen Stapleton, Dennis Christopher, Stockard Channing, Brian Kerwin, Linda Purl and for a recent Broadway revival Laura Linney and Cynthia Nixon. The cast of the current revival by Antaeus Theatre Company in Glendale may not contain the same star quality names but its cast fits these roles like an elegant, perfectly fitted glove or tuxedo. The Hubbards of Alabama are a trio of vicious siblings, more wolves than foxes. Brothers Ben (Mike McShane) and Oscar (Rob Nagle) run a general store that gouges its customers, especially the Negroes, in town. They have done so since they replaced the area’s aristocracy in the aftermath of the Civil War. It’s 1900 now and the brothers are scheming to ensnare a Chicago manufacturer in building a mill in town, near their cotton fields. They can just see the money it will generate. 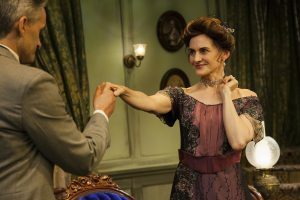 So does their sister Regina (Deborah Puette), cut out of the family business by her father but hoping to use the financial resources of her banker husband Horace (John DeMita) to get her third of the action. Horace has never liked the greed of the Hubbards and has refused to give his consent (and money) to the deal, angering Regina and leading to desperate and tragic maneuverings. Also caught up in the family web of deceit and desperation are Birdie (Jocelyn Towne), a former plantation belle who was bought by Oscar to be a prisoner in a loveless marriage and Alexandra (Kristin Couture), Horace and Regina’s innocent 16-year old daughter who is being used as a pawn in the power play. Oily and quite dim Leo (Calvin Picou), the son Birdie hates having given birth to, ends up playing a key role in the family saga. 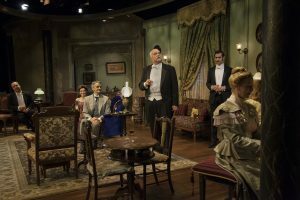 Cameron Watson has directed the piece as if it were a malevolent concert with each actor getting at least one solo spot to shine, and these actors don’t misplay a moment in the spotlight. Picou is bungling and unfocused, Nagle is blustering, peevish and violent, McShane is a master manipulator until he is out manipulated by Puette, who proves to be a true Black Widow. Be grateful you aren’t a member of this family. DeMita brings a quiet and forceful dignity to the man of integrity, but his is a losing battle. Couture slowly grows a spine before our eyes and in her final scene she emerges as a vengeful butterfly. Towne seems a scattered and beleaguered former Southern belle, she admits she has not had a single day of happiness since her marriage, and yet she imbues love and kindness with every breath. Strong support is given by Timothy Adam Venable, William L. Warren and July Louise Johnson. John Iacovelli designed the richly appointed parlor setting that many members of the audience would have been happy to move in to. Terri A. Lewis designed the gorgeous period costumes. 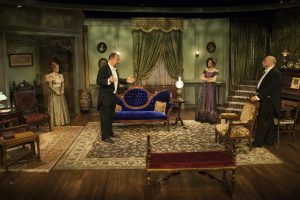 Lillian Hellman’s The Little Foxes is a true American classic and Antaeus has given it a sterling revival to be remembered for years to come.